This week, in a significant distribution agreement, Ballymaloe Original Relish will be on the shelves of 403 Woolworths stores across Australia. Ballymaloe Foods, the family-run business in East Cork owned by Yasmin Hyde, daughter of Myrtle and Ivan Allen of Ballymaloe House, marked its 26th year in business this year. Ballymaloe Foods have been working with Taste Ireland in Sydney for their online shop and in some select Irish pubs in Australia for several years but this is the first time that there will be such a substantial distribution deal throughout Australia, meaning Ballymaloe Original Relish will be widely available, on the shelves in time for Christmas. Made with 100% natural ingredients from a family recipe dating back to 1940’s, the little jars of Ballymaloe Relish will now be making regular journeys from their home in East Cork and on to the shelves of Woolies on the other side of the world, helping to bring something new to Australians and a taste of home to Irish ex-pats. 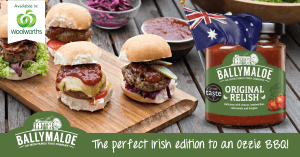 The timing is perfect, moving into summertime for Australia, Ballymaloe Original Relish is just the thing for adding some fresh flavour and spark to the barbie. The 210g jars of Ballymaloe Original Relish will be on the shelves of the Irish and UK section of the international aisle at Woolworths across Australia.